If you have opened the bidding, you visualise an imaginary “barrier” above your opening suit, but at the next level. If you hold just 12 -15 points you should avoid bidding “above the barrier” as this shows a stronger hand and partner may be forced to bid at too high a level – leaving you with a contract that you don’t have enough points to make. 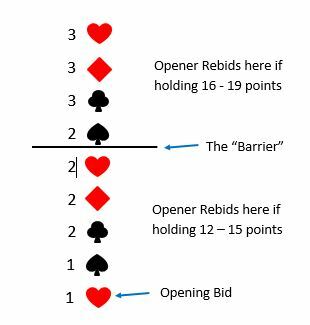 In this example, opener has bid 1 Heart and partner has bid 2 Clubs. Imagine openers hand has the 5/4 shape with 5 cards in hearts and 4 cards in spades. It’s tempting to rebid 2 Spades to show you have the 5/4 shape, but that forces partner to bid at the 3 level if they can’t support your second suit. If you only hold 12 -15 points, you might not have enough points between you to achieve 9 tricks. So you should simply rebid your opening suit at the 2 level. If you rebid “above the barrier” this tells partner that you hold 16 – 19 points and they can bid accordingly.